Spring has sprung and we’ve got a calendar full of fun events for you to enjoy with your kids. Here’s something to do every day of the month. Start planning your egg hunts now with our 2019 Easter Egg Hunt Guide for Indianapolis and Surrounding Areas. Tweens can build life skills with Cooking in the Park at Christian Park. 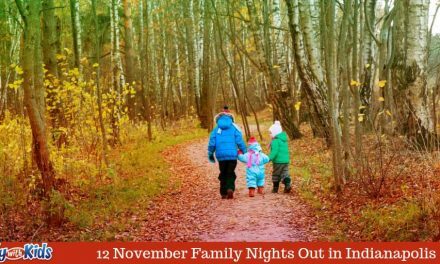 Take advantage of Family Dinner and Craft Night with Beech Grove Parks and Rec. Enjoy Spring Break Fun in the Greenhouse at Tuttle Orchards. Check out a Free Spring Movie at Goodrich Theaters. Celebrate Martinsville Candy Kitchen’s 100th Anniversary. Head to Spring Fest at Purdue University. Explore the Robot Petting Zoo at the Westfield Library. Find a Touch-A-Truck event near you. Indulge with a chocolate bunny and a ham dinner – it’s Easter. Battle it out in Nerf Wars with Washington Township Parks. Enjoy $5 Family Night at The Urban Chalkboard. Skip kitchen duty and enjoy a Friday Night Fish Fry. Build a Mini Fairy Garden at McCloud Nature Park. Introduce your little ones to Classical Concerts at the Central Library Branch. Homeschoolers can enjoy Teen Homeschool Spring Art at the New Palestine Library. Get ready for Earth Day by learning about Pollution Science at the White River Library. Fairyville kicks off at Nickel Plate Arts. Special needs parents can enjoy a night off while the kids head to Adaptive Tykes Night Out with Carmel Clay Parks and Rec. The Indians are back with Friday Night Fireworks. Sign up for a Family Art Class with Kira and Toodleydoo Toys. Head to the Hussey-Mayfield Library for Sleeping Beauty Story Time with the Ballet Theatre of Carmel Academy. Check out Chess Club for Kids at Indy Reads Books. Play a game of Family Putt Putt at the New Palestine Library. Explore Art + Nature Homeschool Day at Newfields. Experience a Sensory Friendly Movie Showing at AMC. Dads and daughters can share some special time together at the Daddy Daughter Dance at The Bridgewater Club in Carmel. Don’t miss the Indy with Kids PLAYdate and Unicorn Tea Party at Table + Tea. Cooking is Made Easy for Teens with this class at the East 38th Street Library.